The role of social media in medicine and health is enormous and continuing to grow. There are now thousands of blogs, websites and on-line health care directories to provide vast amounts of health information to interested readers. Mobile applications are an essential tool for clinicians and patients alike; for everything from handy drug dosing information, clinical calculators to patient glucose monitoring and health promotion aids. As a huge fan of all of social networks, blogs and social technologies – I’ve added this page for all of our affiliated sites/ blogs/ directories and media applications. If you are interested in being listed – please send me a comment with your blog/ site title, brief description and internet address. 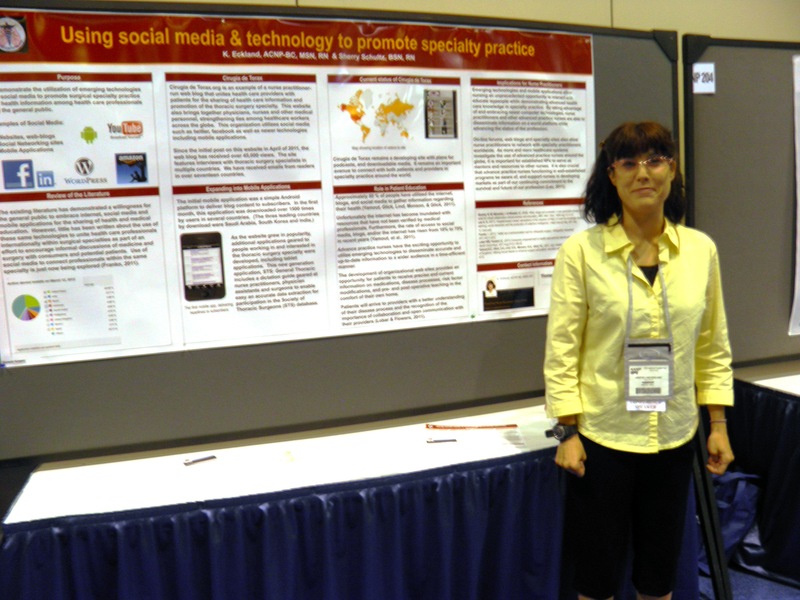 I’ll be presenting a poster at the American Academy of Nurse Practitioners (AANP) on “Social media & the use of technology in Specialty Practice” this June, so if you are in Orlando, be sure to stop by. June 2012: Surgeons and social media gets a boost as reported in thoracic surgery news this month: one of the primary reasons surgeons cited use of social media was to improve their connections with patients. Boulos, N. M, Maramba, I. & Wheeler, S. (2006). Wikis, blogs and podcasts: a new generation of web-based tools for virtual collaborative clinical practice and education. BMC Med. Educ. 2006 Aug 15; 6: 41. Franko, I. (2011). Twitter as a communication tool for orthopedic surgery. Orthopedics, November 2011;34(11):873. Lau A. S. (2011). Hospital-based nurses’ perceptions of the adoption of Web 2.0 tools for knowledge sharing, learning, social interaction and the production of collective intelligence. J Med Internet Res. 2011 Nov 11;13(4):e92. Yamout,S.Z., Glick, Z.A.,Lind, D.S., Monson, R.A., Glick, P.L. (2011, July). Bulletin of the American College of Surgeons. Utilizing Social Media to enhance surgeon and patient education and communication. 96(7). p. 8-15. Dr. Kevin, MD – one of the best-known medicine blogs by a primary care physician, Dr. Kevin Pho. Dr. Shock’s Neurosurgery specialty blog – posts about social media and surgery. Foundation for the Advancement of CardioThoracic Surgical Care (Facts-care.org) – an international organization aimed at multidisciplinary care of cardiothoracic patients. Blog and website, with information on annual and regional conferences with lectures on all aspects of anesthesia, ECMO, LVADs, transplant, thoracic surgery and cardiovascular pharmacology. Useful write-up! I definitely enjoyed it. I actually have looked over a very similar blog pertaining to orthopedic surgeons. Its surely worth looking at. I’m sorry. It I can’t do consultations by email. I can recommend where to go near you, if that helps.